Another “flower” that has been folded for quite some time. Diagram by 山口真 or やまぐち真 /YAMAGUCHI Makoto. Again this four-sided version makes a pair with a six-sided one and again you will have to wait to see it. The name of this rose is いれもののバラ or in the english title Rosy Twist Case; the case comes from いれもの・入れ物 that means container. 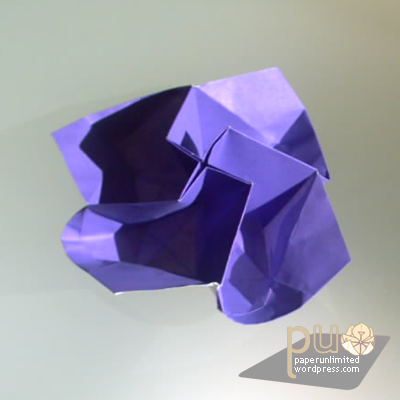 The diagram for these flowers is on 折紙探偵団 MAGAZINE 通巻93号 /Origami Tanteidan Magazine number 93. 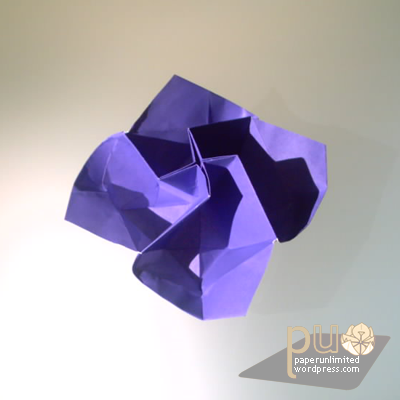 This entry was posted on 2007|07|22 at 09:44 and is filed under origami. You can follow any responses to this entry through the RSS 2.0 feed. You can leave a response, or trackback from your own site.